Until a month ago, I had never taken a spin class. While friends and colleagues made regular pilgrimages to boutique fitness studios like SoulCycle or Flywheel, the allure of sweating buckets and feverishly cycling en masse to the beat of Beyoncé as an all-too enthusiastic instructor shouts encouragement about “feeling the burn, baby!” eluded me. Mostly, I prefer to exercise alone. But there I was at Peloton’s New York cycling studio. Inside the windowless room one wall was lined with mirrors while discreetly located cameras trained on the high-octane instructor. We gathered on the sleek, steel, high-tech bicycles arranged in a semi-circle facing him. A Peloton employee helped me clip my shoes into the pedals and explained how to manipulate settings on the bike’s sweatproof touchscreen. Then the overheads dimmed, the spotlights came on and our teacher welcomed us to the studio as scores of riders streamed the class live in their homes. It was a ’70s (the Clash, Bowie) rock ride—and within minutes my heart was thumping, my muscles were engaged and sweat poured down my face. We increased resistance to the beat of “Who Do You Love,” pedaled hard, used hand weights to do bicep curls and on the instructor’s command alternated our speed. Half an hour later, it was over. I was drenched but elated, awash in the twin senses of achievement and excitement that seasoned Peloton fanatics know so well. I was hooked. In the exploding “boutique fitness” category, Peloton, an interactive cycling platform, is the latest spin. 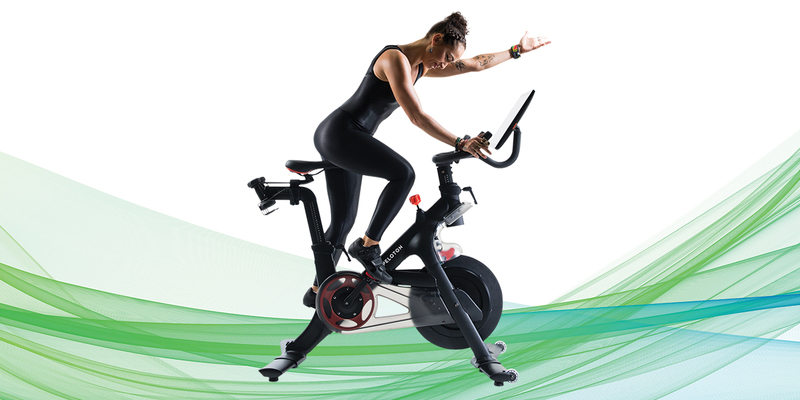 But make no mistake, Peloton is not just another indoor bike studio. More than SoulCycle 2.0, this is a tech startup that is reinventing the estimated $83 billion global fitness industry. The 6-year-old company’s business model is based on digital content and a growing rider community—1 million at last count (celebs like Michael Phelps and Neil Patrick Harris are fans)—connected through Wi-Fi and social media that does the heavy brand lifting. Daily classes can be taken at a studio, beamed on demand at home on a Peloton bike or directly via app to an iPhone or iPad. Sweatproof touchscreens monitor metrics like distance traveled, calories burned, heart rate, resistance and output exerted as measured in watts. A leaderboard allows riders to compete against others. Last year, Peloton generated $400 million in sales—more than doubling its revenue in 2016—via its proprietary bikes ($1,995) and subscriptions ($39 a month for unlimited classes, live and archived), as well as its apps, custom shoes and apparel. One of the most talked about startups, Peloton has gone through five funding rounds, most recently tallying $325 million. During its latest round, Noah Wintroub, a Peloton rider and a vice chairman at JPMorgan, who worked on the deal last year, told Business Insider, “Oh my god, these guys are the Apple of fitness.” And, with its recent $1.25 billion valuation, Peloton is now officially a unicorn. In the midst of a growth spurt with new products and executive hires, including new CFO Jill Woodworth, a former JPMorgan managing director, the company appears poised for an IPO. This story first appeared in the May 28, 2018, issue of Adweek magazine. Click here to subscribe. Sara Ivry is Brooklyn-based freelance writer, editor and podcaster.